The rat is found worldwide and historically, they have played a major role in disease transmission, a fact still important in today’s world. Also, the rat is the second most commonly used animal in biomedical activities, exceeded only by its relative, the mouse. Rats are usually about 250 mm long and adult females usually weight 250 - 300g where the adult male weighs 450 - 520g. They characteristically have a long tail that can be used to warm themselves up in cold weather (by increasing blood flow in this area) and they have a life span of 2.5 - 3.5 years. In the wild, rats are largely nocturnal and live in burrows. However, they are also known for their propensity to inhabit human dwellings either around structures or actually gaining entry into them. They are notorious for destroying food supplies. As a result of their gnawing ability, far more food is destroyed than eaten. Also, they are known to gnaw at insulation in wire and even penetrate metal pipes. Rats will eat almost anything including: seeds, nuts, vegetables, fruits, meats, and invertebrates. However, they especially prefer grains and root crops. 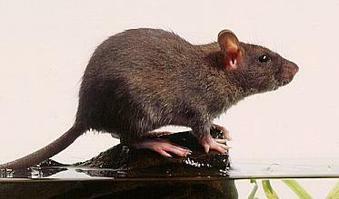 Rats polyestrous (having multiple periods of heat) and as such breed throughout year with nocturnal mating cycles. Ovulation, however, is spontaneous. A female rat can produce a litter at just 3 months and she usually births five times a year. The average litter size is 6-12 pups about 5-6 grams at birth. They are hairless and have closed eyelids and ears. The pups use call sounds that are at a high frequency so that any possible predators will be unable to hear them. Occasionally with new mothers cannibalism is expected, but under normal conditions, pups are weaned at just 3 weeks of age.